Ahmedabad-based Dev Print and Pack will be setting up a corrugation unit this year after having commissioned a full-fledged carton unit in 2017 at Santej in Gandhinagar district. The company also has a unit in the city which houses a 5-color pre-owned press as well as designing and prepress departments. Dev Print and Pack has invested approximately Rs 27 crore in setting up a brand new building; buying a Bobst Novacut 106E diecutter and Bobst Visionfold 110A-2 folder gluer with HHS gluing unit; importing a pre-owned Heidelberg CD 102 6-color plus coater imported from the US and then retrofitting it with an IST UV system; and installing a Tianchuen laminating machine. 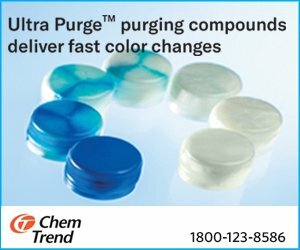 In May, the company also bought a sample making table from iECHO, which was supplied by Mumbai-based Emerging Graphics. Dev Print and Pack was founded in 2015 as an offshoot of Dev Offset, which was started as a screen printing unit. Gradually, it began investing in technology and infrastructure and took close to two years to fully set up a carton printing unit with all the top equipment in its press as well as converting departments. Dev Offset has more or less exited the conventional commercial printing segment and just caters to customers of premium wedding cards. Both Dev Offset and Dev Print and Pack are managed by brothers Samir Patel and Chirag Patel. The company currently prints and converts metpet cartons, drip-off UV cartons, Braille cartons, foil stamping cartons and laminated cartons, among many others for pharma, cosmetic and food industry. Having established itself in the carton segment over the last three years, Samir Patel believes it is time for Dev Print and Pack to expand its gamut of services. “The main idea behind setting up a corrugated unit is that a lot of our current customers also require 3-ply E flute solutions. We want to service those customers as well,” he says. 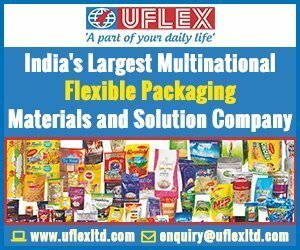 The corrugation unit will be placed on the second floor of Dev Print and Pack’s Santej plant. With the new corrugation unit in operation, the company will be opting for further expansion in its converting section. “At the moment there is a lot of pressure on the Bobst Visionfold and once the corrugation unit is in operation, that pressure will only increase. We will have to surely go for another folder gluer,” he adds. During the early days of Dev Print and Pack, cartons made up just 10% of its business while the rest was wedding cards. Now that gap is bridged with both cartons and wedding cards contributing 50:50 to the business. According to Patel, this has been possible because of the steady investment in quality machinery and technology like Bobst and Heidelberg. “We had booked the Bobst Novacut 106 after a very short time of setting up Dev Print and Pack despite our volumes being very low at that time. But we knew we wanted top of the line technology. 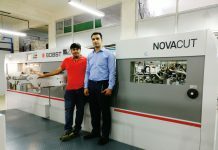 We wanted peace of mind in our converting department, which I feel is very critical in the whole chain, so we went for the Novacut and Visionfold,” shares Patel. Talking about how Bobst technology has benefitted the company, Patel says that there has been a significant increase in productivity and reduction in downtime in operations when it comes to the converting department. “The makeready is accurate while the changeover is very fast, which has helped us deliver jobs to our customers in time,” he says. Also, all the embossing work that Dev Print and Pack does is executed on the Bobst Novacut. 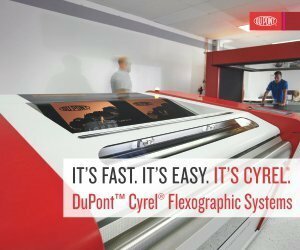 “Initially, we thought we were taking a big risk by making such a big investment in two new Bobst converting equipment. However, looking back now we realize we have had a great experience working with Bobst machines. Given this experience, we will most likely opt for a Bobst Expertfold as our second folder gluer,” says Patel. The company is planning to place the printing and converting operation under one roof at the Santej plant and keep the designing, prepress and storage at the unit in Ahmedabad city. It also plans to add another press, which will most likely be a Komori or Heidelberg.